Helen Radice, on her harp-driven site Twang Twang Twang, quotes W. H. Auden: "Every high C accurately struck demolishes the theory that we are the irresponsible puppets of fate or chance." Genau. When I hear Deborah Voigt soaring up effortlessly to A in "O hehrstes Wunder" in Die Walküre, I think, this is going to change the world somehow. I'm doing a Slate dialogue with Alex Abramovich, the stylish gentleman on the right, about the new Bob Dylan memoir. A warm welcome to those visiting from that fine publication. 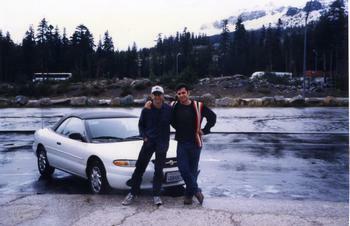 Alex joined me on my great Dylan road trip of 1998. The New York Times, May 20, 1993. Out of contempt for tradition, out of loyalty to the absurd, Erik Satie filled his scores with unperformable commands. "Arm yourself with clairvoyance," he would write; "open your head"; "be visible for a moment." He outdid himself in the short piano piece entitled "Vexations," writing at the top of the page: "In order to play this motif 840 times, one would have to prepare oneself in advance, and in the utmost silence, through serious immobilities." It was left to John Cage to take Satie at his word and organize a nineteen-hour performance of "Vexations" in which the piece was actually heard 840 times in a row. The event, in September of 1963, required a rotating squad of pianists, drew attention from the "Guinness Book of World Records" and brought out a team of critics. Complete performances of "Vexations" have now become something of a tradition. One pianist has even attempted the feat solo; he stopped after fifteen hours, experiencing intense hallucinations. On Saturday and part of Sunday, the downtown performance space Roulette brought "Vexations" back to New York. Once again, a crowd of pianists participated; there was also a procession of official counters, assisted by computer. The audience waxed and waned, from five to thirty people. There was, unfortunately, only one reviewer covering the event. This twenty-hour concert, closing a brilliantly varied season at Roulette, was intended to mark the 100th anniversary of "Vexations" and also the composer's birthday. But the monumental character of the affair seemed to have more to do with Cage's procedural avant-gardism than with Satie's bohemian anarchy. There is no evidence that Satie's instruction was anything more than an arcane jest. As the musicologist Richard Taruskin has recently argued, Cage's art was founded in part on a willful misinterpretation of Satie, a plain reading of his paradoxes. Still, the endless repetition has the virtue of focusing attention on the revolutionary nature of this music, its defiance of harmonic order. "Vexations" dates from Satie's period of Rosicrucian mysticism; the arcane Masonic-style rites fashionable in the Paris of the 1890's inspired Satie to re-invent harmony as floating, sculptured sound. Sketchy diminished chords alternate in hypnotic succession, with brief melodic shapes drifting through the upper lines and a chaconne-like theme churning in the bass. Roulette's pianists — over twenty of them, switching off every hour — provided a fascinating variety of perspectives. Robert Ashley played the piece with meditative concentration; Joshua Pierce found a beguiling, lilting lyricism; Kirk Nurock imported twentieth-century upheaval; Kyle Gann gave the music a marked forward motion, at one point bringing his tempo in sync with a car alarm outside; and, at the end of the night, William Duckworth played with uncanny steadiness and stillness. While a few under-rehearsed pianists struggled with the piece's illogical, fiendish notation, no one was participating on a lark. I arrived at 11 A.M. and stayed through til four the next morning, with periodic breaks and one extended crisis of confidence around midnight. Toward the end, my brain seemed to go completely blank. Epiphany came only during an escape outside onto West Broadway: suddenly, after the insanity of unstoppable pianism within, the night sounds of the city were pure music.